"How smart cloud-connected devices are transforming companies"
Smart cloud-connected devices are changing how value is created for customers, how companies compete, and how it can be helpful in reshaping the industry structure into a cloud connected IIoT environment. Secure IIoT On-Ramp Suites are designed to accelerate the transformation of industrial devices into smart, cloud-connected devices. 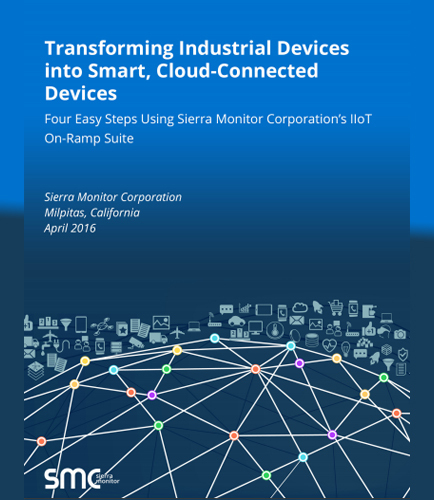 This informative whitepaper outlines four simple steps in using IIoT On-Ramp Suite; and in making it simple rather than daunting to develop a roadmap towards a smart, cloud-connected IIoT environment. What smart, cloud-connected products are and how they can redefine the industry boundaries? How smart cloud-connected devices are transforming companies and their competition? What are the steps involved in transforming semi-smart products into smart, cloud-connected products using the IIoT On-Ramp Suite? Consumer IoT vs industrial IoT: What are the traditional distinctions between consumer IoT and industrial IoT? What the Consumer IoT can teach the IIoT?